South African cricket writer Neil Manthorp told a wonderful story on Sky’s Cricket Writers on TV the other day. He told how, on the Proteas’ tour of England four years ago, Morne Morkel, stressed, worried, and having a bit of a rough time of it with his bowling, knocked on Hashim Amla’s hotel room door. “What can I do for you, Morne?” said Amla. He did nothing for the next half hour or so but sit quietly in Amla’s room, watching while the devout Muslim South African batsman of Indian descent prayed. Morkel would say later that the calmness and serenity exuded by Amla helped settle him, made him feel less anxious. He certainly made the ball disappear, during his marathon 13-hour innings of 311*, running England’s below-par bowling attack ragged as they failed to live up to their pre-match reputations. Amla is all soft hands, swivelled wrists and perfect timing, “minimum of effort, maximum of effect”, as CB Fry once said about that other great stylist, Victor Trumper. Regardless of whether or not you have Amla’s level of faith, just watching him on television is an experience spiritual enough to confirm cricket as your religion; his batting makes converts of us all. Gary Kirsten said before the Test that preparation isn’t about runs and statistics and warm-up matches against counties. It is about mental readiness. It is about the focus and intensity that is only experienced in Test matches, and can only be honed by playing international cricket at the highest level. 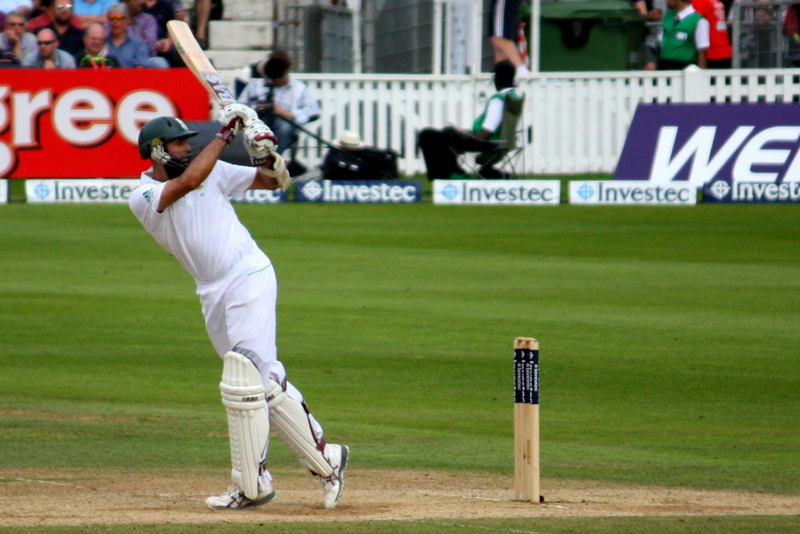 Amla is the most conspicuous example of this focus; captain Graeme Smith, an impressive, imposing individual who leads from the front, personifies its steel, and if you want an example of intensity, look no further than Dale Steyn’s scream of celebration when Graeme Swann became his 5th wicket on the last day. So much for an “undercooked” South Africa. With the exception of the first day, the rich fare they served up proved too spicy in the end for England’s weak stomachs. The sheer extent of England’s capitulation at the Oval – and a comprehensive defeat by an innings and 12 runs is even worse than it sounds, and is about as humiliating as it gets if you’re the world’s No. 1 ranked team – was surprising, and if you’re an England fan, not a little worrying, especially when you consider that of the nine Tests England have played since beating India and attaining top spot, they have lost five of them. That, beyond the specifics of this Test that make especially grim reading, is concerning. Andrew Strauss talks a good game, and is always careful to warn against underestimating the opposition, but a few of us will have considered the possibility of complacency, before hastily smothering that thought, lest voicing that accusation make it true. The simple fact is that a batting surface that Matt Prior called “attritional” and on which he hoped England’s bowlers would get wickets “in a cluster” proved the most benign of surfaces for South Africa’s batsmen, and while Dale Steyn steamed in like the last rhino in Africa faced with the poacher’s rifle and determined to make a fight of it, England’s quicks looked down on speed and devoid of aggression. South Africa took 20 wickets; England could manage to take only 2 over the course of the five days. Graeme Swann, worryingly, is having a dismal summer: in home Tests this year he has taken only 6 wickets for 433 runs. That is only 2 more wickets than his South African counterpart, Imran Tahir, took in this Test. It’s too early to panic, of course. We wanted a competition, and we’ve got one. England have not ascended the Test tree without showing they have their own inner steel and the mental fortitude to bounce back from setbacks, as they demonstrated after their drubbing in the 3rd Ashes Test at Perth. “One of the things we pride ourselves on is being a pretty resilient bunch,” said Strauss at the time. Subsequent events were, of course, to prove him right. The Proteas may have made mice of England’s men at the Oval, but now these mice must roar at Headingley. If they do not, then might be the time to start panicking. When, after Australia’s 4-0 ODI defeat by England, Mike Atherton asked captain Michael Clarke what, if anything, he has taken from the series, the more facetious among us may have been tempted to fill in our own answers: trench foot; double pneumonia; the gloom that settles in one’s soul due to the constant drip, drip of prolonged and unseasonable rain. Gods, it has been an awful summer, and Australia’s five-match tour was as damp and drab an affair as the weather that accompanied it. The batting of the visitors was rickety; their bowling as penetrative as a soggy cocktail umbrella at a washed-out garden party. The jet stream, which has hung over Britain like the albatross round the neck of the Ancient Mariner, is shifting and it finally seems that from next week warmer temperatures and bluer skies will be in the offing. Just in time, then, for the commencement of a series that promises to be the sizzling braai to the international season’s so far soggy sandwich of a summer. Much has already been written of the mouth-watering head-to-heads between the England team and their South African counterparts: Anderson versus Steyn; Broad versus Morkel; Strauss versus Smith; Pietersen versus Kallis. South Africa are fired up after an arbitrary, unfortunate demotion recently in the Test rankings to 3rd position, and motivated by a strong desire to pay tribute to their fallen comrade Mark Boucher, forced into early retirement after a flying bail punctured his eyeball at Taunton – a horrific injury and one from which he will hopefully recover fully. For England’s part, Andrew Strauss has admitted that his team’s humiliating defeat in the UAE over the winter still stings, and he knows they cannot rest on their laurels simply because they are number one. Before the Australia series, I was reluctant to tempt fate by predicting victory for England, and the same still applies. But, if forced to nail my colours to the mast, I’d say England have the edge. While Strauss’s sentiment (often expressed since England reached top spot) that you should never underestimate the opposition is worth heeding, maybe it’s time to recognise that England really are that good. But you can bet that if the spoils go to the visitors, it’ll still have been a cracking series, so in terms of great Test cricket, we’re all winners, really. The battle of the bowling attacks will be interesting; the swing of James Anderson versus Dale Steyn’s raw speed has been given top billing, but look for Vernon Philander and Tim Bresnan to make their mark as well. Philander has taken over 50 Test wickets so far in a career that’s only 7 Test matches old. He is accurate, gets the ball to move through the air and off the seam, and looks well suited to English conditions. Tim Bresnan is used to playing the support act to the headline stars, but surely the hackneyed view of him as a good, honest Yorkshire cricketer is starting to sound just a little patronizing. Averaging 26 with the ball and 40 with the bat, with two nineties to his name, he deserves to be regarded as more than just the yeoman dray horse to Broad and Anderson’s thoroughbred royalty. One man above all will be fired up, and if his 234* for Surrey against Lancashire the other week is a statement of intent, then god help the opposition. That Kevin Pietersen is in the news again is not really news these days, but in leaving him out of the provisional 30-man squad named today for England’s defence of the Twenty20 World Cup, Andy Flower has underlined his intention to make no exception for players who do not wish to play all three formats. The latest ruckus over KP is that, in his willingness to come to some agreement with a view to carry on playing Twenty20, one of the proposals his management team have put forward to the ECB is that he agree to play some ODIs if he can be allowed to play in the IPL in its entirety, which would mean missing the two-Test series against New Zealand in May. The timing and reporting of all this admittedly has me a little uneasy. Details of Pietersen’s “demands” have apparently come from sources within the ECB, among whom it is known that Pietersen does not have many friends. An off the cuff remark, or a strategic leak calculated to turn public opinion against a man who needs to be loved as a way of forcing him to reconsider his position? God knows it does not take much these days, but it seems that once again we are all Foaming At The Mouth About Kevin. Andy Flower has said Pietersen may look back in years to come and regret not going to the 2015 World Cup, but regret is a double-edged sword that can cut both ways; all is rosy in England’s limited-overs garden at the moment, but come the Twenty20 World Cup in September and England may wish their Player of the Tournament in 2010 was still with them. Regardless of who you think is the more principled, the more arrogant, or the more inflexible, that it has come to this is sad indeed. Before all that, though, there’s a Test series to be won, and boy, will this be some contest. Something to set this summer alight at last.